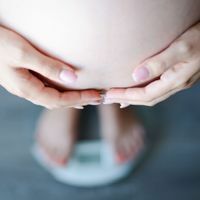 While scientists have identified several genetic risk factors for diabetes and obesity, some have proposed epigenetic alterations in gametes as another potential mechanism of disease risk inheritance. 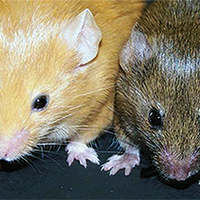 Now, a mouse study by researchers in Germany provides new evidence in support of this epigenetic inheritance theory, showing that different diets in otherwise identical mice can determine glucose intolerance and obesity risk in offspring via egg and sperm cells. The team’s findings were published today (March 14) in Nature Genetics. Approximately 90 percent of nearly 350 million cases of diabetes worldwide are classified as type 2. In addition to environmental factors often cited to explain the high prevalence of the disease—including poor diets and sedentary lifestyles—several epidemiological and mouse studies have hinted that diet-induced susceptibility to obesity and diabetes, acquired during parents’ lifetimes, can be inherited. However, previous analyses of the phenomenon have relied on in vivo fertilization to produce offspring, explained Beckers, making it difficult to distinguish heritable, epigenetic determinants in the gametes from other factors that can influence offspring development, such as the composition of paternal seminal fluid or diet-induced changes in the uterus during pregnancy. 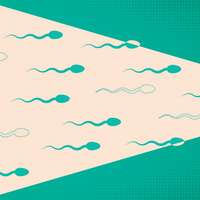 To circumvent this problem, Beckers’s team turned to in vitro fertilization (IVF). First, the researchers fed male and female isogenic mice one of three diets—high-fat, low-fat control, or normal—for six weeks. As expected, mice fed a high-fat diet developed obesity and severe glucose intolerance. 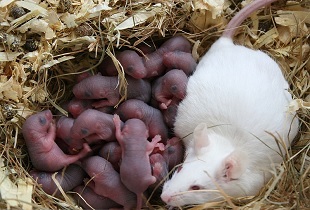 The researchers then carried out IVF with egg and sperm cells from various pairings of mice fed on the same or different diets, and implanted the resulting embryos into healthy surrogate females, thus eliminating parental influence on offspring beyond the contribution of gametes. For nine weeks after birth, the new generation—comprising more than 350 mice—ate a normal diet. The team then “challenged” all offspring with a fatty diet, and recorded the animals’ weight over the next six weeks, as well as the animals’ responses to injected glucose. What’s more, despite maintaining insulin production, male and female offspring of mothers fed a high-fat diet showed significantly higher glucose intolerance than other members of the cohort, whatever the paternal diet, indicating primarily egg-cell transmission of insulin resistance. 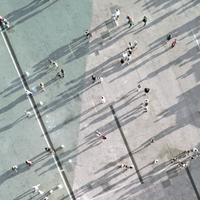 Andy Feinberg of the John Hopkins University School of Medicine in Baltimore cautioned that although the study was “very well-designed and well-controlled,” extrapolations to human biology would require further research involving more complex genetic backgrounds. “To generalize and say that this transgenerational effect is a major contributor in human diabetes—I don’t think you can draw a conclusion like that from a single inbred strain of mice,” said Feinberg, who was not involved in the research. For now, the team hopes to home in on the mechanisms accounting for heritable epigenetic modifications acquired during a parent’s lifetime, said Beckers, adding that he and his colleagues are already investigating diet-induced changes in the gametes’ RNA transcripts and methylomes. P. Huypens et al., “Epigenetic germline inheritance of diet-induced obesity and insulin resistance,” Nature Genetics, doi:10.1038/ng.3527, 2016.